Because business size and requirements are diverse and the training process dynamic and continuing, learning management system does not come as a “one-size-fits-all” solution. Those who think of it as such end up disappointed. In fact, 44% of organizations were found to be unhappy with their current LMS and 48% wanted to find a different learning technology. Matching LMS software to your organization’s needs is crucial and likewise difficult mainly because features and capabilities that you’re looking for come at a price. Even free LMS solutions will eventually cost you something down the line such as lost opportunities or potential revenues because of inherent limitations. But for this article on how much does LMS software cost, we’ll focus on premium solutions. For both small and large businesses (the former with budgetary constraints and the latter with adequate resources) the question that levels the LMS equation is – is it worth it? The answer is yes. LMS software provides benefits worth your investment including a knowledgeable and engaged workforce, improved productivity, savings in time and resources, and lower training costs. However, before we tackle our LMS pricing comparison let’s first understand how vendors price their LMS product. The question how much does learning management tools cost depends on a lot of factors and it is important you learn prevalent LMS pricing strategies. There are two general types of LMS deployment and their costs occupy opposite ends of the scale. Perpetual License – a one-time upfront cost that can range from less than $500 to more $20,000. Setup Fee – charge for installing an LMS that can run over $25,000. As you can see, the variety of pricing plans and models available makes it necessary for you to seriously study your options. Before you commit to any LMS solution it is crucial that you take into account the frequency and length of time you’ll be using it as well as the number of users. To further guide you, we’ve come up with this LMS pricing comparison categorized into small business solutions and enterprise platforms, so you can narrow down your choices depending on the size of your business and potential number of learners. 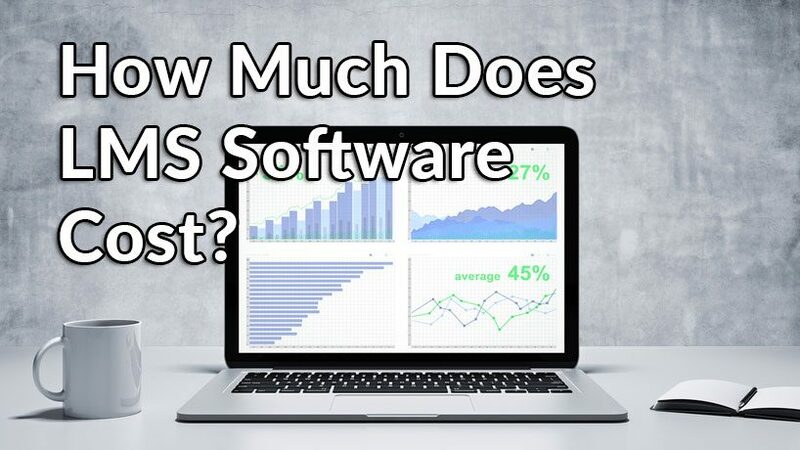 How Much Does LMS Software Cost? For small and starting business, how much does LMS software cost is a decisive question. Many will opt for free LMS solutions. However, unlocking the full functionalities and capabilities of LMS software is only possible with premium offerings. Below are some of the leading small business LMS software that you can consider. Litmos is one of the leading corporate LMS that unifies virtual, classroom, mobile, and social learning in an intuitive cloud platform. It is intended to provide training professionals with a secure and scalable LMS solution that can meet any organization’s training requirements. Among its key features are an online course builder, instructor-led training, assessments and quizzes creation, reports and dashboards, gamification and leaderboards, messages and notifications, and surveys and feedbacks. It is highly recommended you explore the features first before committing to a plan. You can easily sign up for a Litmos free trial here. Litmos also comes with pre-packaged e-commerce features that let you monetize your courses and set up an online storefront through the Litmos/Shopify integration. With capabilities to automate both internal and external learning programs, Litmos is often referred to as the simplest and easiest LMS that doesn’t require dedicated trainings or expensive installations. It employs a pay-per-user pricing model in its two plans – Pro and Pro+Courses – that scale as you add more active users. TalentLMS is a fully customizable cloud LMS designed to help you train your employees, partners, customers or students. It allows you to quickly build e-learning courses, configure and personalize course with our branding or specific requirements, apply simple and comprehensible analytics to get insights from your learning environment, and get comprehensive support for SCORM & TinCan (xAPI), notifications, course selling, video-conferencing, and gamification, among other features. The vendor has a comprehensive test-drive offer if you want to check the features first. You can sign up for a TalentLMS free trial here. TalentLMS covers all the essentials that you expect from an e-learning solution such as creating, cataloging, and managing courses; assessment and grading tools; extensive reporting on test results; communication tools; certifications and compliance; integration with 200 apps and services; and security mechanisms and protocols. Aside from a Free plan, the software is offered in four premium plans with two of them – Small and Basic editions – priced below $100/month. Canvas LMS is a popular online learning platform geared towards educational institutions. It provides a customizable learning environment and design which allows you to educate as you envision, and your students to learn the way they want. Simplified communication is facilitated between teacher and learner, ensuring that both can smoothly collaborate on the learning process. The system is designed to help you craft learning tools for your students. You can provide feedback, combine videos, blogs, wikis, and other channels of education, while tracking your students’ progress. On the other hand, Canvas LMS let students obtain notifications, submit paperwork, and interact with the learning materials given to them on the machines they use. They can also integrate their Canvas LMS account with their social media such as Facebook and Twitter. Pricing for the software is quote-based depending on number of users, training, support, and other requirements of the institution. Blackboard is a fully-loaded, out-of-the-box LMS suite with an array of configurable e-learning and training features that makes it applicable for use by K-12, higher education, government, and business. The web-based software empowers businesses and educators to teach and train their employees or students through a virtual environment. It offers a course management system, customizable open architecture, and scalable design enabling you to merge the system with student information system and authentication processes. The software stands out when it comes to course management including creating, categorizing, importing and exporting, and delivering course materials in multiple formats. It also offers resource management, self-paced instruction, and integration with a variety of business systems and applications. Blackboard is available through custom pricing depending of the number of users. Moodle is a widely used open source solution available to download for free and can be utilized by both educational institutions and corporate organizations. It allows you to make your own private online hub that you can fill with dynamic courses that your students can access anytime, anywhere. Moodle comes with a comprehensive set of learner-centric tools and collaborative learning environments to facilitate both teaching and learning. The software brings simple interface, drag-and-drop features, and well-documented resources, along with ongoing usability improvements. Moodle offers a “freemium” plan with basic features. If you need more options and functionalities you have to upgrade to the next paid plan. GO1 is a robust learning management software that allows you to upgrade the skills and capabilities of employees for a small price. GO1 offers cost-expensive pricing plans for teams of various sizes, with the standard enterprise plan from $2 monthly per user. This already grants users access to over a thousand course, custom-built courses, and a 24/7 support team that guarantees that all your concerns will be addressed in a timely manner. The platform features employee tracking capabilities, enabling businesses to quickly determine the performance and progress of various employees in their respective courses. With its highly configurable reporting tools, you can gauge employees on various metrics including professional development and compliance. Two premium options, costing $25 per month for up to 20 users or $9 per user per month for up to 100 users. Large companies account for more than 30% of LMS buyers. However, having enough resources doesn’t mean they get the best software. It all boils down to having the right software that addresses the company’s requirements. Here some of the top enterprise-level LMS solutions today. Docebo is an easy to use cloud LMS built to help you organize, track and distribute online courses for formal learning of your employees, partners, and customers. It allows your employees to ask questions and get answers from subject matter experts within your organization as well as capture user-generated knowledge, validate it through peer-review, and share it across teams. You’ll be able to identify your organization’s skills and competency gaps and close them by assigning formal and informal learning interventions with Docebo’s skills management system. The vendor offers a great free trial plan for those who’d like to try out the key features of the product first. You can easily sign up for Docebo free trial here. With Docebo you can easily upload and share your training materials like PPT, PDF, SCORM, Tin Can and Video files. Its course tracking features together with a rich set of default and custom reports enable you to efficiently and conveniently monitor and track the training performance of your workforce. All of Docebo’s three pricing plans – Starter, Advanced, and Enterprise – are by quote and follows the mix of license fee plus setup fee and pay-per-user pricing model. eFront is a fully adaptable LMS solution that scales to fit your needs. It offers enterprise-grade deployment options – on cloud or on premise – and an extensive set of customization features that you can adapt to your portal’s look and structure as well as integrate your training into your enterprise environment seamlessly and efficiently. It offers several security filters and administrative tools to safeguard your training data, is mobile optimized and ecommerce ready, and brings API and over 32 native integrations. If you want to try the features at no cost you can easily do so when you sign up for a eFront free trial here. eFront comes complete with all advanced LMS features including administrator and learner tools, course management, eCommerce, customizations, and access to the software’s source code. Four tiered pricing plans are offered on pay-per-user basis. Workwize LMS is a cloud hosted and fully automated course and policy compliance learning management system. It is intended to assist training administrators and HR managers by automatically enrolling employees and emailing them reminders to ensure they fully conform to training and policies required by their jobs, as well as minimize risk and governance issues for your organization. The vendor offers an attractive free trial plan. Simply sign up for a Workwize free trial here. Built within the software are features to identify non-compliant teams, individuals or offices; document sign-off/distribution for rolling out documents and proving acceptance and understanding; rapid course authoring for creating unlimited SCORM e-learning courses; and over 40 editable courses covering core compliance subjects, among others. Two plans – Professional and Enterprise – on a pay-per-user basis. eloomi is an online LMS platform that offers company HR managers the tools to build engaging content on the fly and give people up-to-date onboarding, compliance, skills training and any other communication on their mobile device. For employees, eloomi delivers a solution that lets them easily access materials, content, news, and instructions to ensure continuous learning and improvement. Want to try the features before committing to a plan? You can easily do so when you sign up for a eloomi free trial here. The software is optimized for desktops, laptops, and mobile devices, eloomi is an ideal solution for building and distributing learning instructions, training programs, modules, and guidelines to facilitate onboarding, skills development, compliance training, and other learning activities. It likewise provides insights where you can measure the impact of your learning and development efforts. Schoology puts together learning management and assessment management to help you create objectives-aligned assessments that are managed from one central location and delivered in the normal course workflow. It allows you to easily produce and disseminate course materials while providing a collaborative and adaptable learning experience that systematizes content management. Schoology’s student-centric platform enhances collaboration, pulls in learners, and lets users share training resources, best practices and more on a local and global scale. It streamlines the systematic processes of content production and management, grade recording, attendance and more so you can spend less time on administrative tasks. eCoach is content authoring and LMS solution. Initially designed as a content authoring platform, it allows users to easily create interesting learning courses through drag-and-drop authoring templates. eCoach also features drag-and-drop templates for its course management, making it easy for you to organize your learning schedule for learners. This solution enables users to create multiple branded LMS campuses, with each one having their own branding. Coupled with its ability to toggle permission levels, conducting training becomes more orderly and structured with eCoach. Various assessment tests can be conducted to gauge understanding and performance, complete with granular and visual reporting so you can better gauge learner’s understanding and performance. Data derived is also highly useful for refining your future courses. Learning materials in eCoach is optimized for all types of devices. Basically, all materials will automatically resize to fit your screen. It also allows users to engage with your learning courses anywhere, and at their own convenience. $99 to $899 per month for 100 to 5,000 users. Regardless if you go for a small business LMS solution or a full-fledged enterprise LMS software, keep in mind that a good LMS should be user-friendly, applicable for your type of business or organization, and provide value for money. Oftentimes when looking for an LMS software, you’ll only see the upfront cost. It is important that you contact the vendor and have all the fees and prices that you’ll encounter for your particular situation laid down on the table. That way the answer to the question of how much does LMS software cost will be fully transparent to you, devoid of surprises or hidden fees.